Sunshine introduces Security Microprinting! This technology helps companies prevent fraud with sequenced inventory control codes that are printed on the package, text, and copy to verify product authenticity. 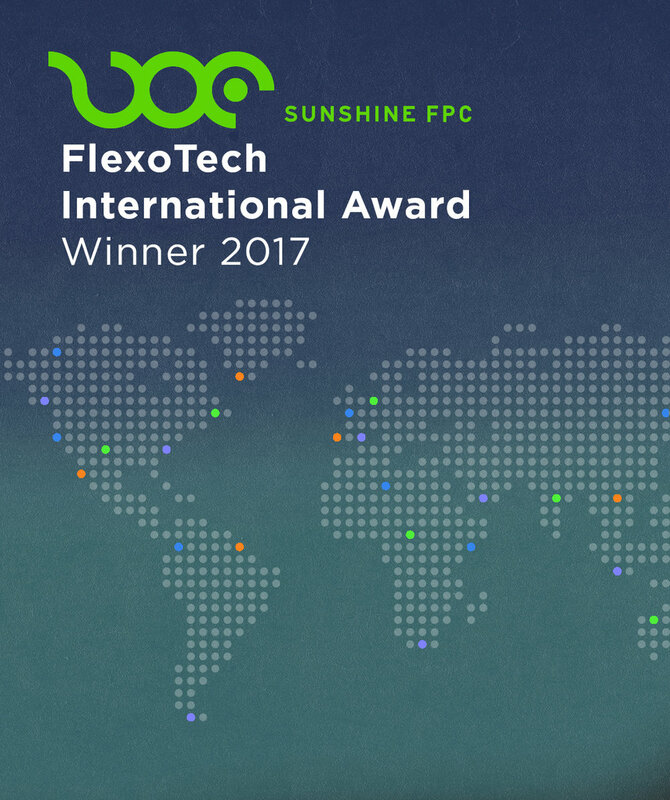 Sunshine FPC is the proud recipient of FlexoTech International’s 2016 Best of Print Award. The Flexotech International Print and Innovations Awards are distinguished and celebrated worldwide, seeing submissions from industry leaders with the highest standard for printing across European continents. A prestigious win for our hard-working team. When clients envision vibrant and wildly detailed results for their packaging, they come to Sunshine. Flexographic printing requires a level of passion and execution that continues to bring Sunshine recognition amongst the best in the industry. It is with great delight that we announce our 7th consecutive win of “Best of Show” awards in the 2016 Excellence in Flexography Awards. With over 2,500 entries from around the world, Sunshine received double the honors for its Roast Figs and Apricots Wrapper and its Jeweled Nougat Delights Wrapper. Winning Best of Show in the wide web sector and crossing new boundaries into the mid web category. Employing untried screening technologies for a job presenting a high degree of technical challenges was not the easiest route. Today, we are proud to announce the flexographic industry has encouraged such efforts. Sunshine took home the prestigious Best of Show Award at the 2015 FTA International competition. We’ve set a new benchmark for GRACOL Densities by producing a wider color Gamut and eradicating previous standards. “Their commitment to continuous development has clearly earned Sunshine an industry- leading position,” said Dr John Anderson of KODAK, “There are a lot of elements here, all of which add to the degree of difficulty.” “You guys are Printing Tomorrow, Today”. Sunshine FPC, Inc. has reached beyond its boundaries and surmount new heights at this year’s FTA competition. Winning its 4th consecutive gold award and also the grand prize of Best of Show. Traditionally excelling in polymer substrates. Sunshine has surpassed its own limitations, wining the competition with a paper substrate entry. Taking the initiative to show brand owners what the possibilities could be to enhance the value of their brand. We’re thrilled to announce that Sunshine FPC, Inc. has once again earned top honors, taking home the Gold Award and the prestigious Best of Show title in the wide web category at the Flexographic Technical Association’s 2013 Excellence in Flexography Awards. Sunshine bested competitors from leading manufacturers worldwide, solidifying its position as an industry leader on the global stage. Entries were judged based on level of execution and degree of difficulty, with heightened creativity being a common theme throughout the competition.